The Clairwood Fil Coupe Dress Shirt is the quintessential shirt for spring. This light blue shirt features soft, pink fil coupe dots for texture and visual interest. This ultra-lightweight style is super breathable and feels like a barely-there shirt so you can soak up the sun. Constructed from 100% cotton, sourced from luxury mill, Albini. 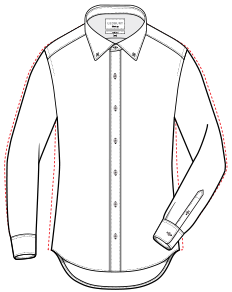 Finished with the Ledbury Spread collar and a shortened body length. Available in classic and tailored fit. Fabric: 100% cotton, sourced from luxury Italian mill, Albini.